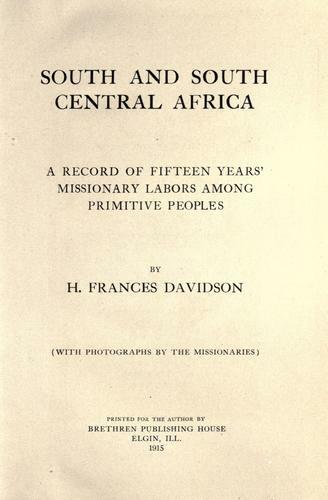 In case you missed the note about it in my Photo Friday post, pioneer Brethren in Christ missionary H. Frances Davidson‘s 1915 book, South and South Central Africa, is now available as a free download at Google Books. The book recounts Davidson’s experiences as one of the first five Brethren in Christ missionaries to present-day Zimbabwe. It also describes her and partner missionary Effie Rohrer’s enterprising trek from South Rhodesia to present-day Zambia, where they established the denomination’s second mission station, at Macha. I’ve recently downloaded the book to my iPhone — now I’ll have something good to read on those long SEPTA regional rail rides. I read Frances Davidson’s book 40 years ago when I worked in the BIC Archives at the college. As I was already interested in missions, Dr Wittlinger assured me that South and South Central Africa was a “must read.” Despite the age of the book, he told me I would find it interesting, and it was. I have personally traveled a lot, but I cannot imagine striking out the way this early missionary did, and accomplishing all that she tackled…and having time to write about it! Truly an inspiration.